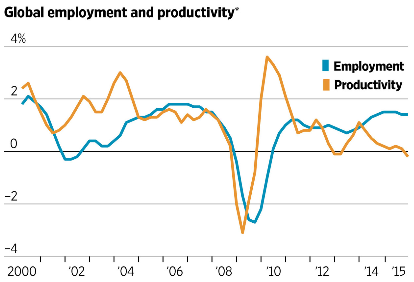 Growing Employment, Shrinking Productivity: What Does It Mean? Slow economic growth which has averaged only an anemic 2.1% since the end of the Great Recession seven years ago. Exploding national debt, now the highest it has been since the end of WWII. Unless we can quickly shrink our annual deficits down to zero, and therefore stop adding to the debt, interest payments on the debt will eventually rise to horrendous levels. Two recent newspaper articles address the slow growth problem. Greg Ip, writing in the Wall Street Journal, points out that (worldwide) employment growth is up while productivity growth is down (see chart below). Neil Irwin, writing in the New York Times, explains this dichotomy by pointing out that most job growth in the last decade has been in (low productivity) services rather than (high productivity) manufacturing. In other words, the U.S. economy is now producing lots of new temporary and contract jobs which do not add very much to the overall economic growth which produces higher wages and overall prosperity. Over-regulation. The Dodd-Frank Act and Affordable Care Act, for example, are hampering growth by strangling the financial and healthcare sectors of the economy. Inefficient Taxation. Growth oriented taxation would have the lowest possible marginal rates paid for by shrinking deductions. Taxing consumption rather than income and savings would be even better. Illegal Immigration. Solving our immigration problem would turn millions of illegals into productive citizens. An adequate Guest Worker program and e-Verify enforcement would solve this problem without the need for amnesty. Conclusion: There are solutions to the severe economic problems facing our country. Does our political system have the flexibility to adopt these workable policies? This entry was posted in debt, economic growth, Greg Ip, immigration reform, Jack Heidel, Neil Irwin, New York Times, tax reform, Wall Street Journal and tagged debt, economic growth, fiscal responsibility, New York Times, tax reform, Wall Street Journal by jackheidel. Bookmark the permalink. I wish that I had more trust or faith in the electorate. At best, I give them credit for judging character. At worst, I see them not being capable of understanding the distinctions between running one’s household and monitoring as well as acting in the bests interests of the country. The many players, the complexities, the contradictions and the leadership qualities of the leaders imposed too many balls to juggle at once for most working Americans. Besides they are too busy and also too restricted in their use of the media. At best it is a single network and rarely are the books and newspapers nearby. Still what democracy we have is better than all other types of rule. I basically agree with you on all of this. Most voters will have a very hard time evaluating specific policy issues which candidates support. As you say, our very imperfect democracy has stood us in very good stead for the last 225 years or so.